The Aug. 12 meeting between Cambodian prime minister Hun Sen and Lao prime minister Thongloun Sisolith came after Hun Sen on Friday threatened military action against the neighboring country if its troops were not withdrawn by Aug. 17. The contested area between Cambodia’s Stung Treng province and Attapeu province in Laos is part of a small stretch of border still not clearly marked, and tensions flared earlier this year after Lao troops crossed the river to block Cambodian construction of a road through the area. Laos agreed to withdraw the dozens of troops remaining after Hun Sen pledged to stop construction of the road, Lao prime minister Thongloun Sisolith said in a press conference following their meeting in the Lao capital Vientiane on Saturday. “Samdech [honorific] Hun Sen and I have agreed that the Lao side will pull back all troops remaining in the area following his promise to stop building the road through the [conflict zone], and I have ordered the relevant officials to withdraw by no later than tomorrow morning, ” Thongloun said. “Secondly, Prime Minister Hun Sen has ordered the withdrawal of all [Cambodian] troops being deployed to that area so that the situation can be returned to normal, and so that the people of both our countries can be assured that unwanted incidents will not occur,” he said. 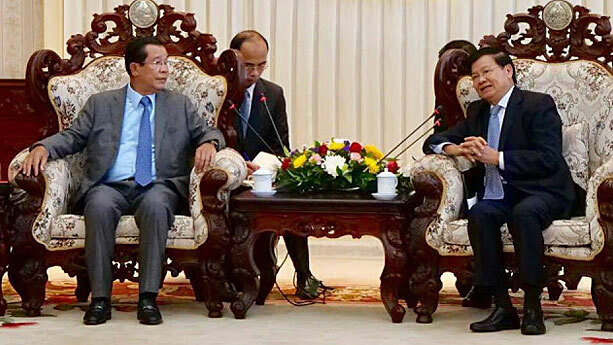 Both Laos and Cambodia will now move forward to resolve outstanding border issues “as soon as possible,” Thongloun said. Troops from both sides have now pulled back from the Huay Thanau area of Phouvong district in Attapeu province in Laos, and from Ratanakiri province in Cambodia, a senior military and public security official in Laos's Champassak province told RFA's Lao Service on Monday. "[We] coordinated yesterday evening," the official said, speaking on condition of anonymity. Political commentators calling Hun Sen’s threat of war against Laos a political move aimed at gaining votes “will not be tolerated,” the prime minister said, adding that one critic—Khmer Power Party president (KPP) Sourn Serey Ratha—has already been arrested for insulting Cambodia’s army in an Aug. 12 Facebook post. A Cambodian war with Laos would be a war fought “to build up the face and status of those thieves who disguise themselves as heroes to mislead us,” the opposition party politician wrote. Speaking to RFA’s Khmer Service, KPP spokesperson Tep Virak said that Sourn Serey Ratha had not intended to attack the country’s army in his post. “He just wanted to say that the real victims [in a war] are the rank-and-file soldiers,” he said. Sorn Chey-—executive director of the Cambodia-based Affiliated Network for Social Accountability-East Asia and the Pacific—meanwhile dismissed Hun Sen’s warnings, saying that the voicing of political opinions in a democratic country should not affect military morale. “The government should pay more attention to providing resources and better pay. These are the things that motivate the military,” he said. “Points raised by political commentators will not affect the army’s reputation or morale,” he said. Reported by Thai Tha and Savi Khorn for RFA’s Khmer Service and by Ounkeo Souksavanh and Bounchanh Mouangkham for RFA’s Lao Service. Translated by Sovannarith Keo and Ounkeo Souksavanh. Written in English by Richard Finney.